Govino really means "go anywhere you like!" This revolutionary vessel designed for the ultimate enjoyment of fine wine actually works well for any cold beverage. The unique ergonomic thumb-notch makes wine swirling most simple and best of all you can reuse them or even recycle them. Govino really means "go anywhere you like!" Each box comes with a set of four crystal-clear shatterproof "glasses" perfect for indoors or out-at a picnic, an outdoor party, or at poolside. The Govino wine "glass" is actually not glass at all. It is made from a proprietary, food-safe / pharmaceutical-grade polymer "aka" PETG, which reflects a wine's color and projects its aromatics much like crystal. Best of all... once your vino is gone your Govino can be reused or recycled. Important Note: Hand wash only! Govino was designed for commercial use and can withstand most industrial glass sanitation systems (1-2 minutes at 160 degrees). Since domestic dishwashers are so widely varied, we cannot claim this product is 100% "dishwasher safe." what is the diameter and the total height? BEST ANSWER: The height of the Go Vino Stemless flute is 5.3 inches and holds 8 ounces. IS it a set of four as the specs suggest or is it one flute? BEST ANSWER: Thank you for your question. This is for a set of four. If you have more questions please feel free to contact us at 800-356-8466. I have never posted a review about a product yet, but after reading the 2 below, I had to add my comments. I do entertain and serve wine at all parties, and also have a large collection of Riedel, Stölzle, Schott Zwiesel, etc... but have lost many to "accidents" at events. I also am able to BYO at local restaurants and at times have to fit stems in with wine and sometimes 2 types of glasses - making the bag heavy and/or unsafe (breakage). 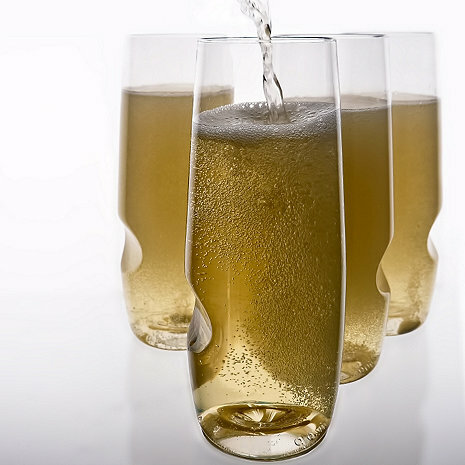 The shape is correct for sparkling wines and same for the red or white version. I have used these in the backyard, with no worries about scratching - safety, etc. They look great, they feel light but crystal clear, and are reusable (hand clean). I have purchased many sets to have ready for events. I give them a very high rating, especially for summertime events! I have given these as gifts and recipients are always wowed and use them at their events. Read that some thought these were too thin, but we disagree. These are perfect for boating and going out in your dinghy in the bay. Friends love them, they don't slip out of your hand, and if they do, they won't break! Four glasses hold an entire bottle of champagne....they are not too small. They are perfect! Looks great , Take them to the beach. I get a lot of complements about them. Highly recommend them. They are just the right size and prettier than I expected. I put them in a gift box with two mini bottles of champagne and the receiver LOVED them. Haven't tried these yet ! But the shape looks like they will be perfect for celebrations and Prosecco! This was the most disappointing purchase I have ever made on-line. Cheap, thin, plastic. Plastic is very thin and champagne glass is no taller than a wine glass.